There are so many things to do in Tbilisi you'll want to stay for weeks. Tbilisi is a city with something for everyone. Trendy cafes for coffee lovers, ancient bathhouses and castle ruins for history lovers and a huge array of delicious Georgian cuisine to keep food lovers satisfied. Party lovers will find bars and underground nightclubs, there’s wine tastings on every corner for wine lovers and fellow book lovers, there’s so much to keep you entertained I wrote an entire article about it! And if you’re just lovers there are viewpoints to watch the sunset, parks to stroll hand in hand through and old town balconies to rival any Romeo and Juliet scene. There really are thousands of reasons to fall in love with Tbilisi but here are just a few. These are the best things to do in Tbilsi to suit any travel style! Tbilisi was founded when the King discovered the sulphur springs that flow through the city. Since then the sulphur baths have been a top attraction in Tbilisi and a Georgian tradition that every traveller should partake in! Picture soaking in a hot pool beneath a domed, tiled ceiling, having all your dead skin scrubbed away and your tired muscles massaged. Sold yet? Private spa rooms (for up to 6 people) start from €10 per hour. Have a read of everything you need to know about visiting the Tbilisi sulphur baths. Sitting on top of the hill above the old town is Narikala Fortress. It’s free to enter the grounds and you can see some of the old castle walls, a church and some tower ruins. There are also amazing views of the city below. 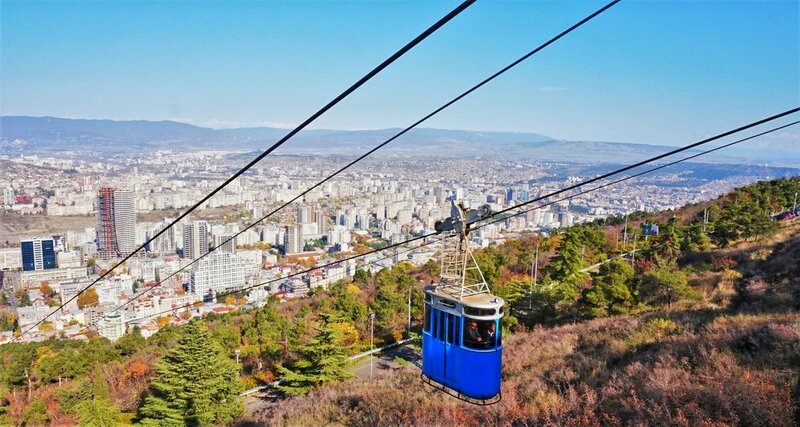 To get there either take the cable car (1GEL from Rike Park) or walk up from the old town which takes around 10 minutes. Across the river from the old town is this giant cathedral. In Georgia, there is no shortage of cathedrals and churches but this one is really impressive. The inside isn’t very remarkable though so spend more time admiring the exterior and the city views. One of the best things to do in Tbilisi is wandering the old town. The Tbilisi old town is simply stunning. Winding streets filled with intricate wooden balconies and secrets around every corner. You easily spend a day getting lost there. Many of the balconies and houses are rundown and have a magical, ancient feel to them but some have been lovingly restored and look amazing painted in bright colours overlooking the street. Not the tourist attraction it should be, this spectacular monument sits on top of a hill just outside the city. You can reach it by metro and a 20 minute walk or a cheap taxi ride. 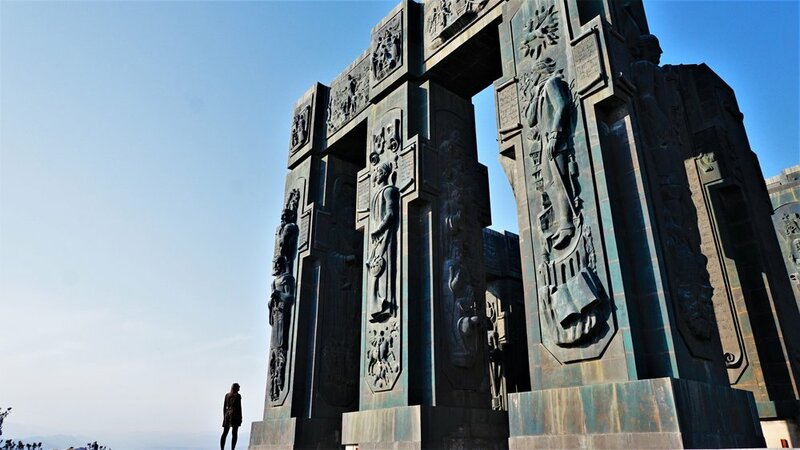 The columns are around 20 metres tall and are carved with pictures representing the history of Georgia. There are great views over parts of the city and the Tbilisi Sea (lake) which you can enjoy with virtually noone else around! Tbilisi has a great foodie scene and there is something to suit every taste and budget. Georgian food, in general, is just amazing if a little carb heavy! If you’re heading to Georgia make sure you read about all the must-try foods before you go. Barbarestan- based on the recipes from the cookbook of Barbare Jorjadze a Georgian princess, chef and feminist from the 1800s. The place is beautifully designed and serves hearty, local food. Black Lion (Shavi Lomi)- The same name as an excellent craft beer served in the city. This place is popular with the artsy crowds and is marked simply by the large black lion painted on the street wall. Great food in a laid-back atmosphere. Orshimo – Seating upstairs in a living room style area complete with fireplace. There is also one table on the balcony looking over a pedestrian street. If you’re there at the right time there is often live piano music. The food is excellent and they, like most Georgian restaurants, have a huge selection of amazing wines! Shemoikhede Genatsvale- This place has stone floors and terraced seating areas with fake vines. It has a really authentic feel and the food is amazing. A meal for two costs around €10 including a litre of local wine! They are famous for their khinkali (Georgian dumplings). Akhali Gemo – Also a stone-floored place with low ceilings and archways. The food was good and very affordable. There was some live entertainment (an old man singing) while we were there which was a bit obnoxious after a while. Veliaminov- A very popular local place which is no-nonsense. The staff don’t really speak English and will treat you like you’re ruining their lives but the food is very authentic and super cheap. The man even tallies your bill on an abacus! Burger House – We spotted this from our balcony at Hostel Pushkin 10. It has a very small menu but really tasty burgers and milkshakes served in jars. Pipes Burger Joint – In the courtyard of Fabrika Hostel this chill little place has indoor and outdoor seating and a great range of delicious burgers. Fabrika- The café inside Fabrika offers a brunch menu on Saturdays and Sundays featuring mini sliders. Really delicious and affordable bite-size burger treats. Extreme budget travellers can still get a meal around the city if you’re ok with living off mainly pastry and cheese. Bakeries all over the city sell a range of delicious pastries and breads filled with cheese, potato or beans for about 50c. If you’re craving some vitamins the Dezerter bazaar also has a range of fresh fruit and vegetables and there are little fruit shops everywhere. Café hopping is one of the best things to do in Tbilisi. The café scene in Tbilisi took me back to my Wellington roots, although it’s not quite as densely café populated. Nevertheless, coffee lovers will be able to get their fix and hang out in some cosy, funky cafes to work, read or just relax after a day of wandering the Tbilisi old town. Coffee Lab – This place is a bit out of the city centre but with a real love of quality coffee. You’ll find special roasts here from all over the world and an array of delicious treats to accompany your cappuccino. Fabrika- Technically part of a hostel but open to the public this huge hangout room offers great food, coffee and décor. It’s inside a converted Soviet sewing factory and features hammocks, comfy couches and Pacman! Cafe Leila - This gorgeous vegetarian café sits right next to the quirky clock tower in the old town. It has beautiful outdoor seating areas and serves amazing food. Narikala Fortress: Take the cable car or walk from the old town. There are great views of the city by day and night. Mtsminda: Take the funicular (2.50 GEL each way) or a public bus. There is an amusement park a the top and the Ferris wheel offers even better views (5GEL per person). The Cable Car to Turtle Lake: In the North of the city. Takes around 5 minutes and drops you near a small lake with some cafés. You can pay using a metro card (0.5 GEL per person). Tbilisi has a place to buy everything and not just one shop. There are entire areas dedicated to certain goods and you can spend your days browsing through retro items and gifts. Dry Bridge Flea Market: Every day small stalls line the bridge and the West riverbank selling everything from records to jewellery. It continues on into an art market. Clothing Market: At Station Square, take any of the entrances to the underground passages and you'll be absorbed into a maze of clothing shops. There are many second hand clothing stores in the area surrounding this so if you're into retro ski jackets and tracksuits from the 80s go for a wander! Gold Market: You don't have to be interested in purchasing jewellery to find this place fascinating. It's located on the ground floor of the train station and is two full rooms of small counters in rows. The area is packed with buyers, sellers and onlookers doing their thing and is interesting to take a look at. Georgia is located on the cusp of Asia and Europe and with an increase in international flights it's now very easy and affordable to get to. Within Georgia, Tbilisi is right in the middle of it all and a great base for exploring the country. Within a day you can be exploring mountains, vineyards, monasteries and beaches, making it the perfect place to start or end a Georgian adventure. We loved our trips to Kazbegi, Signahi, Mtskheta and Kutaisi. Tight Budget: Indie Mindi is very basic but homely. It has a dorm and one very small twin room. Check prices here. Budget Friendly: Hostel Pushkin 10 is clean and comfortable with dorms and a private room. Staff are super friendly and they serve free pancakes every morning! Check out rooms and prices here. Super Funky: The hostel set in a converted sewing factory is definitely a novelty experience and has great accommodation and food options. It's a bit pricier than other hostels but worth the splash out. Have a look at Fabrika Hostel. Splash out: If you can afford it, Rooms Hotel will not disappoint. Very trendy and luxurious rooms and a great courtyard and restaurant. Check it out here. Georgia has been named one of Lonely Planet's top destinations for 2018 so Tbilisi is about to hit the big time. And it totally deserves all the attention. This amazing city has enough to keep anybody busy for several weeks. So make sure you leave yourself some time to explore all the things to do in Tbilisi. But be careful - falling in love with Tbilisi is easy and you may never want to leave!